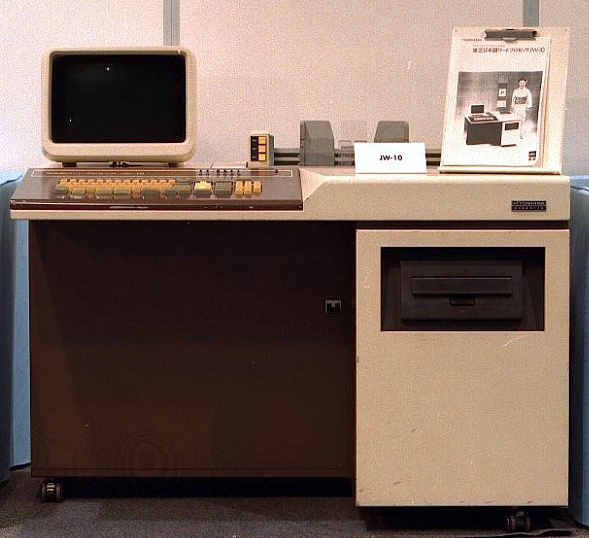 This was the first Japanese language word processor, developed by Toshiba in 1978. It was announced in September 1978, and first shipped in February 1979. At the time, katakana were the only Japanese letters handled by computers (except for some systems using special equipment). In the U.S. and Europe, on the other hand, the word processor had evolved from the typewriter and was widely disseminated, and there was a need for a word processor which could be used with Japanese. Mori Kenichi and others at Toshiba's General Research Center conducted basic research on kana-kanji conversion using phrase designation input, and this feature was incorporated into hardware which was based on the TOSBAC-40L minicomputer and was as big as an office desk. The result was announced as the JW-10 Japanese language word processor. "Phrase designation input" is a method where the reading of a sentence is input in phrase units. In addition to phrase designation input, the JW-10 also allowed kanji (Chinese character) designation input. In kanji designation input, the user inputs a sentence while designating the kanji part. The biggest issue in developing kana-kanji conversion technology was selection of different kanji with the same reading (kanji homonyms). In the end, it was decided to adopt a method based on factors such as the sentence context and use frequency. A maximum of 80,000 words could be stored in the dictionary used in kana-kanji conversion, and frequency management was performed for each individual user. The dictionary contained 54,000 ordinary words and 8,000 proper nouns.pre-stored as standard words. The user could also store words other than these standard words -- 10,000 ordinary words, and 8,000 proper nouns. The JW-10 was equipped with a 10 megabyte magnetic disk and a 24-dot serial printer, and was priced at ¥6.3 million. Later, in May 1980, Toshiba announced the JW-10 Model 2 (an enhanced version of the JW-10), and the JW-5 (a mass-market word processor). The JW-10 Model 2 and JW-5 featured improved operability, enhanced composition and editing capabilities, and lower price. 6,802char (JIS C 6226) 6,802char (JIS C 6226), External chars.